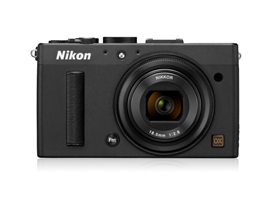 Not wanting to undermine their DSLR sales Nikon have used a smaller 1-inch sensor in their 1 Series of Hybrid cameras but it seems with the Nikon Coolpix A they’re looking to gain market share in the high-end compact market, too. With less versatile fixed lenses and high price tags it’s a niche segment of the overall camera market however and one that’s already brimming with options like the $1299 Fujifilm X100S, $2798 Sony RX1 and $999 Sigma DP3. 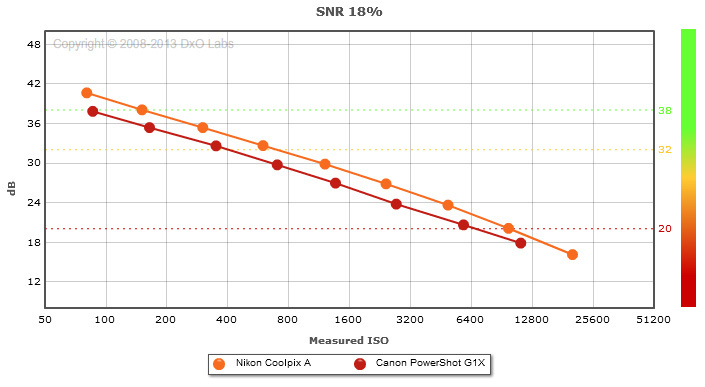 Let’s compare the Nikon Coolpix A’s measurements against high-end compacts, top-end APS-C DSLRs and consider a mirrorless hybrid alternative to put it all into perspective. 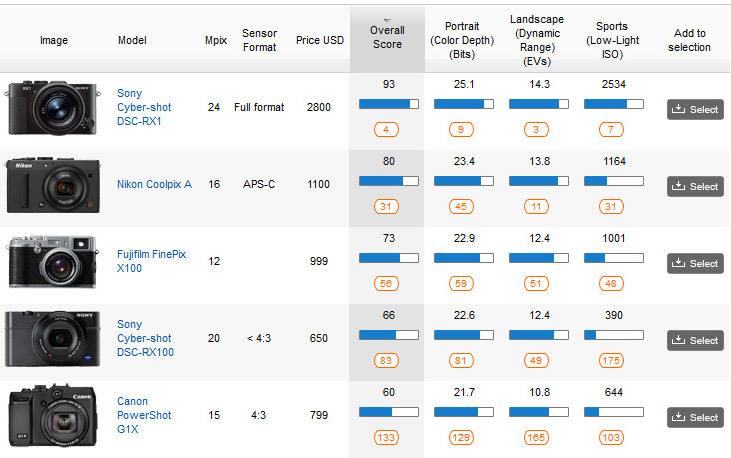 With an Overall Score of 80 the Nikon Coolpix A ranks 29th for all sensors and 10th for all cameras featuring an APS-C sensor. 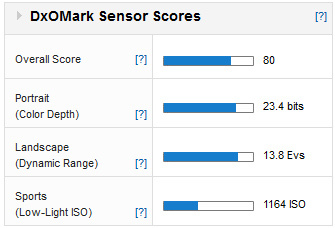 A Color Depth score of 23.4 bits is the lowest ranking aspect, placing 16th overall for APS-C sensors but this is improved on with Dynamic Range where its score of 13.8 Evs is less than ½ Stop behind the class leading APC-S camera, the Pentax K-5 IIs with 14.1 Evs. 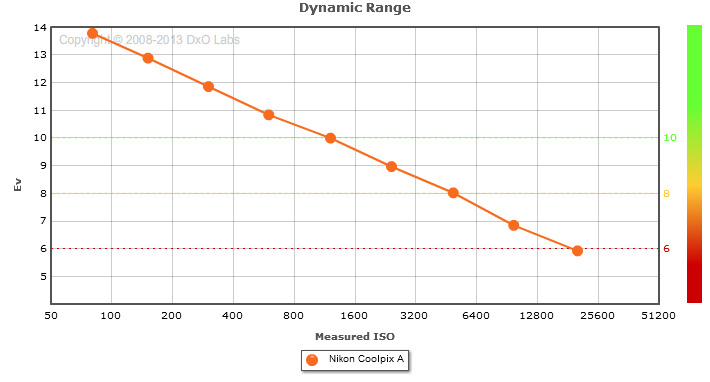 Low-Light ISO results are strong too where ISO 1164 ranks 7th for APS-C sensors and the detailed measurements show top Dynamic Range and SNR 18% results are achieved up to ISO 1600 while Color Depth drops off a stop earlier at ISO 800. In the compact & high-end compact categories the Coolpix A unsurprisingly ranks second in all categories behind the full frame Sony RX1 that, with 93 points overall, offers almost a full stop better image quality. It’s just ahead of another APS-C compact the Fujifilm X100 that scores 73 points overall however and the Coolpix A offers an almost 1 Stop better image quality than the 1-inch sensor used in the Sony RX100. 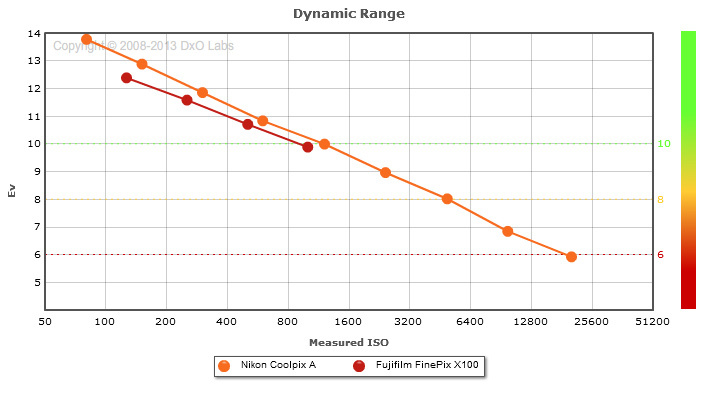 For high-end compact cameras the Nikon Coolpix A ranks second behind the full frame Sony RX1 but just nudges its rival APS-C counterpart the Fujifilm X100 into third. Although a compact camera with a large sensor the 1.5-inch (14×18.7mm) CMOS sensor in the Canon G1X is physically smaller than the Coolpix A’s APS-C model but the Canon compact is a more versatile all-rounder for enthusiasts thanks to its 28-112mm f/2.8-5.6 zoom lens. 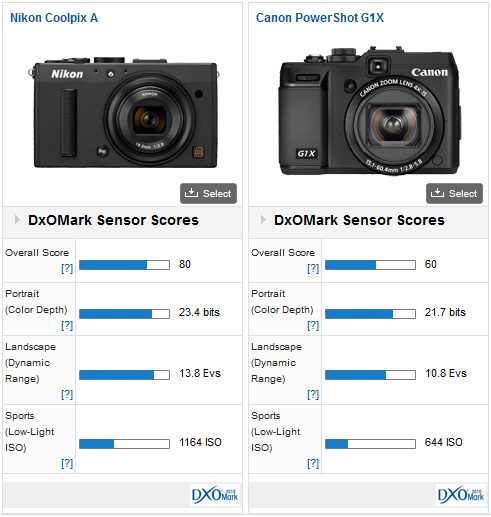 With an overall score of 80 compared to 60 for the Canon G1X the Nikon Coolpix A wins by 20 points and offers +1.33 Stops better image quality overall. The Coolpix A trumps the G1X by +1 Stop with 23.4 bits to 21.7 bits and that slightly larger sensor delivers +2/3rds of a stop better Low-light performance with 1164 ISO compared to 644 ISO. Dynamic Range scores between these two throws up an interesting result however and while at base ISO the Coolpix A is a massive +3 Stops ahead of the G1X with 13.8Evs compared to 10.8Evs the Canon manages to maintain Dynamic Range better as sensitivity is increased and from ISO 1600 results between the two are very similar. Although the Coolpix A offers +3 Stops better Dynamic Range at ISO100 results drop off quicker than the Canon and at ISO 400 the difference is closer to +1 Stop and from ISO 1600 onwards they are the same. Although having the same sized sensor and fixed lens the Fujifilm X100 boasts a larger f/2 maximum aperture and a built in Hybrid viewfinder with framing guidelines and overlaid exposure settings. 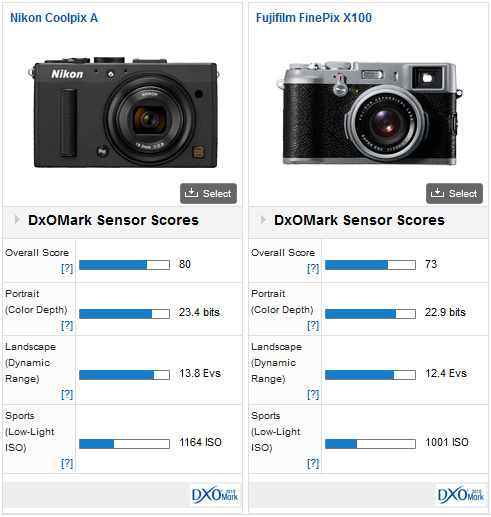 The Coolpix A and X100 are similar propositions featuring a fixed prime lens with an APS-C sensor and have similar image quality although the Coolpix A just trumps the X100 by +1/3rd of a Stop overall with 80 points compared to 73. 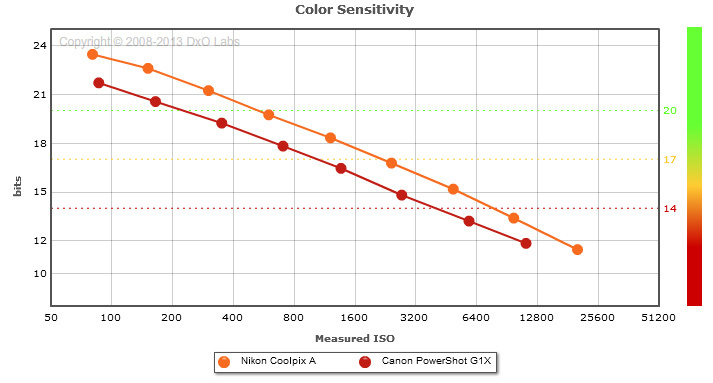 Color Sensitivity results are identical between ISO 200 – 1600 with the Coolpix A just stealing a +1/3rd Stop improvement overall thanks to its lower base sensitivity of ISO 100 and it’s a similar story for Low-light ISO. 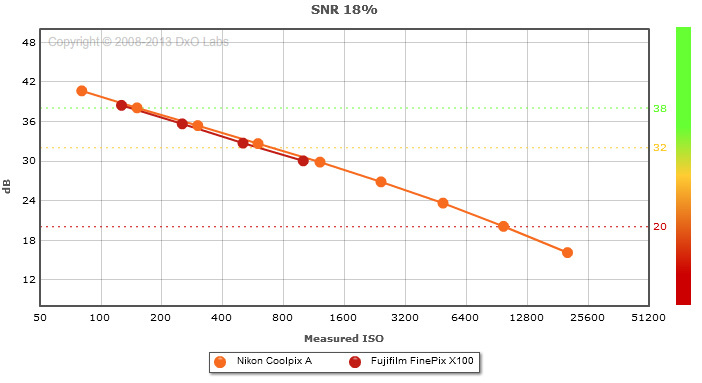 The most notable difference is Dynamic Range where the Nikon’s best score of 13.8 Evs betters the X100’s 12.4 Evs by +1.3 Stops but at ISO 200, the X100’s base sensitivity, results are closer with the Coolpix A’s 12.88 Evs only a +1/2 Stop improvement over the X100’s at this setting. 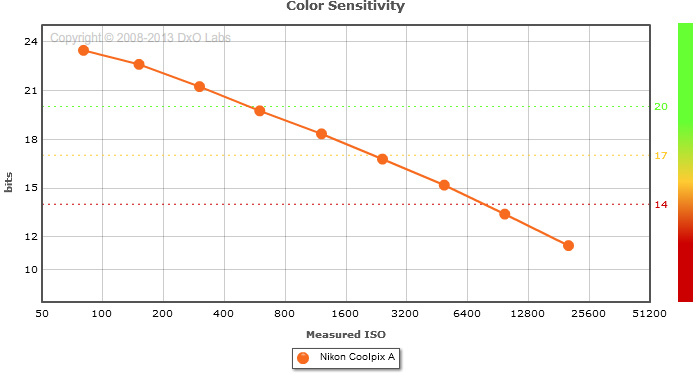 Although giving the same Low-light ISO performance between ISO 200 – 1600 the Coolpix A offers a +1.3 Stop improvement at its base sensitivity of ISO100 and 4 extra ISO settings up to ISO 25600. 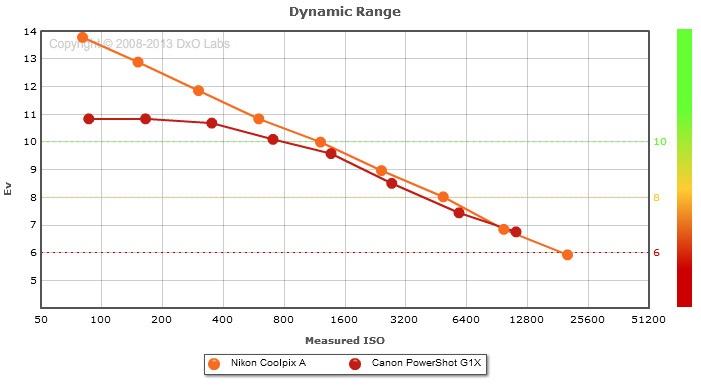 The most dramatic difference between the two cameras are their best Dynamic Range scores where the Coolpix A boasts +1.3 Stops better improvement although the gap narrows as sensitivity is increased. 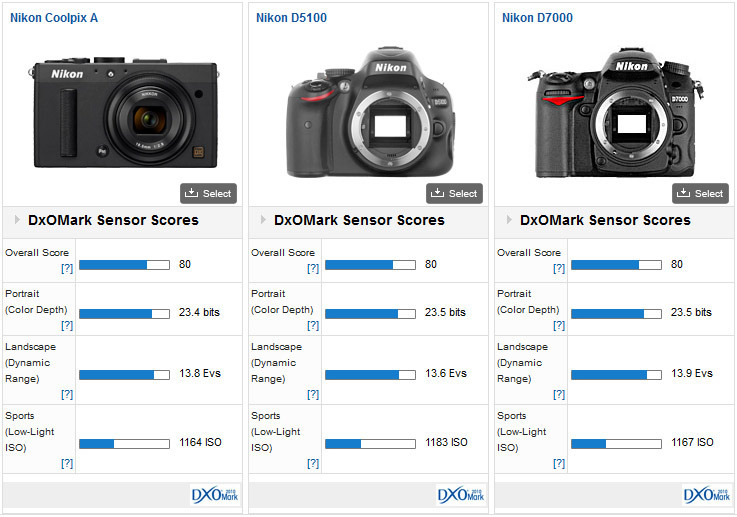 Removing the optical low-pass filter from the sensor used in the D5100 & D7000 hasn’t affected the DxOMark Scores which are almost identical and combined with that prime lens the Nikon Coolpix A’s should yield great results. Without the low-pass filter you’ll need to try and avoid Moiré but this shouldn’t be too difficult shooting on a 18.5mm wide-angle lens. The Nikon Coolpix A high-end compact offers similar or better image quality to many entry-level or mid range DSLRs, and although bettered by the higher resolution D5200 or D7100 DSLRs and the Pentax K-5 series, the Coolpix A still makes the top 10 for APS-C cameras. If it’s a high end compact you’re after though the full frame $2798 Sony RX1 is out in front but the more affordable Coolpix A comes a respectable second just nudging the Fujilfim X100 into third for image quality. If a fixed lens compact is too inflexible however mirrorless hybrid cameras offer more versatility with interchangeable lenses. 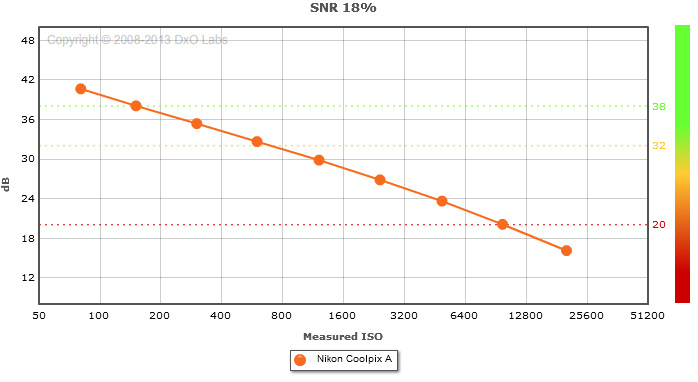 The Nikon 1 series using a smaller 1-inch sensor doesn’t offer the best image quality in this category but those with an APS-C sensor like the $1183 24.3-megapixel Sony NEX-7 deliver very similar quality to the Nikon Coolpix A.